The firmer Sport cup provides a more secure seal and resists compression by strong pelvic muscles but it can be more challenging to insert and remove. This menstrual cup is featured in a beautiful Sapphire blue color in the standard size range -perfect for most users. If the MeLuna will be your first Menstrual Cup YAY! We are here to help if you have any questions. 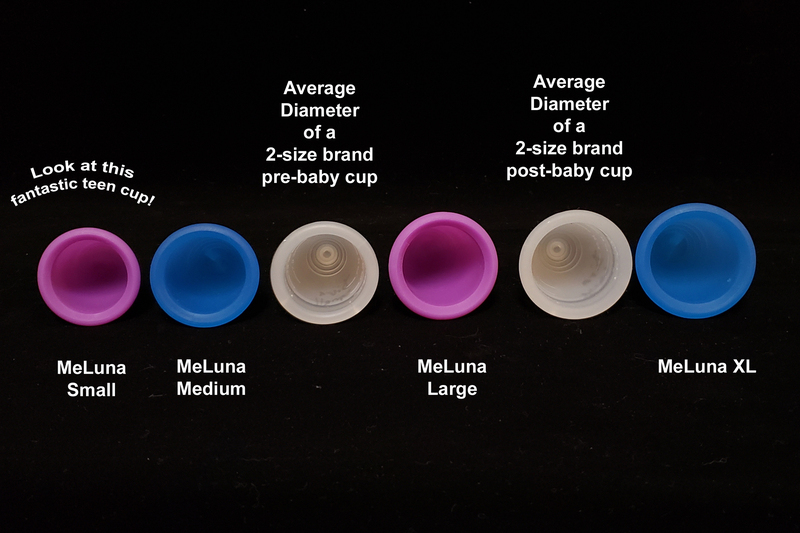 If you arrived here because your previous cup from another brand did not work out, here's a little help in figuring out with which MeLuna to go. Most 2 size brands like the Diva, Lunette, Lena and Saalt cup all have similar diameters. Below is how they fall into the MeLuna size range. For example if the bigger Saalt Cup is a little too wide for you a large MeLuna would have a slightly smaller diameter, etc. This is my 3rd meluna. My first one I had for 5 years! My second, meluna sport shorty, I've had for 3 years. My first one I noticed just recently was becoming less springy so I grabbed a new one. This cup in sport version is great for tight pelvic floors. The price is fantastic, the cups are amazing, I couldn't be happier. It has changed my periods completely, especially with having endometriosis, it makes them a little less dreaded. Very excited about this life upgrade! I'm one full cycle in and so far, I love my meluna! I can't feel it at all and have had no leaking or discomfort or anything weird (the learning curve was much easier than expected!). I love that I can just empty it once in the AM and at night before going to bed, and not think about it all day. I also had the welcome side effect of hardly any cramps, not sure if that was a fluke or the new normal (can only hope!) It did take a little time and effort to figure out how best to get the thing out, but with a few days practice, and some internet help, even that is now very manageable. I did go all-in and used it on a 30 mile multiday backpacking trip, which was maybe a bit much for the first cycle haha... I think I'm still most comfortable cleaning it out with access to clean running water :) but I did make the trip successfully. I originally purchased the Classic, Standard size menstrual cup. I wanted to reduce my overall environmental footprint, and have made tremendous strides reducing my waste. I gave myself a few months (cycles) to get the hang of using the menstrual cup, but the recurring issue I had was that the cup was so flexible that it would not open inside of me and create a seal. I had tried over 8 types of folds, yet seemed to always have bloody leaks. My body is quite small - I am 5'3 and about 110 lbs, I never have delivered children, and quite physically active (biking, walking, hiking, and yoga). I refused to give up! Though I believed the original cup was ideal for a beginner (soft and squishy material), I returned to MeLuna and purchased the Sport cup. Viola! The material is thicker, but not physically uncomfortable. The cup immediately opened up inside of me on my first use and I have never had period leaks. I am in love, and can use this product for over 12 hours comfortably. I would recommend this product to anyone who is even slightly active, because movements such as stretching will easily break the seal of the original-sized cup. The only drawback I have encountered, and I suspect is simply due to my own anatomy, is this: When I hold my bladder for too long (ex: roadtrip), finally peeing is quite difficult - the cup applies some pressure and makes it difficult to RELEASE, resulting in a very slow and slightly uncomfortable pee stream, HA! The cup is easy to clean, I do this after the end of each cycle. My Original cup had the stick-shaped stem, and I found it to be a bit uncomfortable inside of me. It either stuck out or could be felt when sitting. My Sport cup, instead, has the ball stem. Not as easy to get a grip on, but feels much more comfortable and strong (meaning it doesn't feel like it may break off of the cup, like the stem did sometimes when tugging on it). I've used a Diva Cup for years but always had issues with it A. not opening up all the way after insertion, B. being a little too large, and C. being extremely difficult to remove. After hours and hours of research, I came across this gem that solved all of those issues for me. The loop makes removal easy, the firm sides ensure it opens up all the way, and it's exactly the right size. I also like the blue as it doesn't get stained/discolored like my previous clear cup did. I am so, so happy with this!